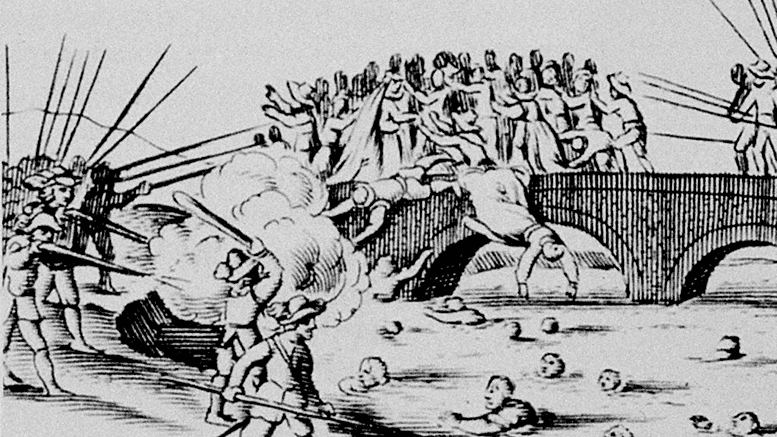 The Irish Rebellion of 1641 came about because of the resentment felt by the Catholic Irish, both Gael and Old English, in regards to the loss of their lands to Protestant settlers from England and Scotland. Catholic Irish were frightened by reports that the Covenanter Army in Scotland was considering an invasion of Ireland in order to eradicate the Catholic religion. At the same time there was also a threat of invasion by Cromwell’s Puritans who were at war against King Charles1. It was hoped that the King would redress the complaints of the Catholics and halt or even reverse the policy of plantation. It was not an act of rebellion against the Royal domain. The uprising was lead by Rory O’ Moore from Leix, with Sir Phelim O’ Neill and his brother Turlough of Tyrone, The Maguires of Fermanagh, the Magennis, O’ Reilly and the MacMahons. They had planned to begin the rebellion on the 23rd October 1641 with attacks on Dublin and various other British strongholds throughout the country. However their plans were betrayed to the British by a native Irish convert to Protestantism, Owen O’ Connolly. Due to this information Dublin did not fall. However the rebellion went ahead in the north and the towns of Dungannon, Newry, Castleblaney along with the fort at Charlemont fell to the rebels. Most of the province of Ulster came under the control of the rebel leaders. The rebel army, of 30,000 men had been instructed to take no life except in battle, to arrest the gentry and to spare the Scottish planters as they were considered kindred. For a week after the rebellion these instructions were adhered to but many of the rebels had lost their lands to the Protestant planters and they wanted revenge. They attacked farms and settlements killing and turning many people away and robbing and stripping them of all their goods. Sir Phelim O’ Neill has been himself thought to have ordered the murder of Protestants in Tyrone and Armagh. It is thought that there were about 12000 people slaughtered though contemporary reports put the death toll as much higher. It is thought that up to 30% of the Ulster planters lost their lives whilst 10% is the figure for the whole of Ireland. As the rebellion progressed in Ulster there were uprisings in Leinster by November and thereafter the whole of Ireland. In Munster were many English settlers were planted, the rebels did not shed much blood but they did turn out thee settlers many of whom fled back to England. In 1642 the Old English formed an alliance with the Gaelic Lords at the Assembly of Killkenny. This alliance caused the rebellion to escalate into the Confederate war which would continue until Cromwell’s invasion and subjugation of Ireland 1649-1653. In 1642 the Scottish Covenanters invaded the North and they in turn took to killing Catholics in revenge for the deaths of Protestants. The Covenanter Clan Campbell of Argyll took the opportunity to attack and slaughter the Catholic Rathlin Islanders who belonged to ancient enemies, Clan Mac Donald. The Covenanters also slaughtered all the Catholics (3000) on Island Magee. Catholic prisoners and traders in Newry were murdered. This ruthless slaughtering of civilians, by both sides, was only brought under control when Owen Roe O’ Neill arrived back from exile in France to take control of the Confederate army and with Major General Robert Monroe in charge of the Covenanter Army, continued the war under the code of conduct that they had both learned on the Continent. However the effects of the rebellion have lasted to the present day, especially in Ulster where sectarian divide remained strong during the troubles.